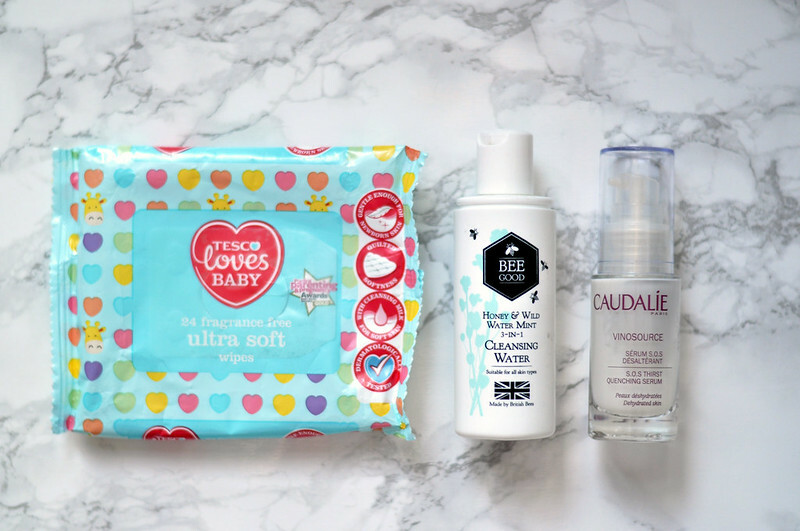 Tesco Loves Baby Ultra Soft Wipes // I don't use these for make-up removal or on my face, instead I always keep a pack of wipes around for if I'm swatching make-up etc. I picked these up as they were on offer and I liked the packaging. I'd buy them again if I was in Tesco but I'd go for a larger pack. Bee Good Honey & Wild Mint 3-in-1 Cleansing Water // I got this mini bottle from the shop part of the Latest In Beauty website for a pound or two and I thought I'd try it. It smelt nice and worked pretty well but I think I'll stick with Garniers version which is what I'm using at the moment. Caudalie Vinosource S.O.S Thirst Quenching Serum // This is one of my all time favourite skin care products and I think this was either my second or third bottle. If you have dry and/or dehydrated skin then you really need to give this a go. It feels very light on the skin and sinks in almost instantly and I find moisturiser always goes on better when I use this. It also has an amazing scent and the pump makes using it a breeze. I'm currently trying to use what I already have and not buying anything new but I know I'll buy another bottle of this at some point. Mio Liquid Yoga // This is another one of my favourite products and I can't believe it's empty. As with skin care, I'm trying not to buy any new products and although I really want to buy another bottle of Liquid Yoga, I'm trying my hardest to resist. It's quite hard to describe, the best description is probably liquid bath salts. You have to shake the bottle well before use as the epsom salts sink to the bottom and then you pour some into your bath water and relax. It's just amazing and another one you must try if you haven't already. 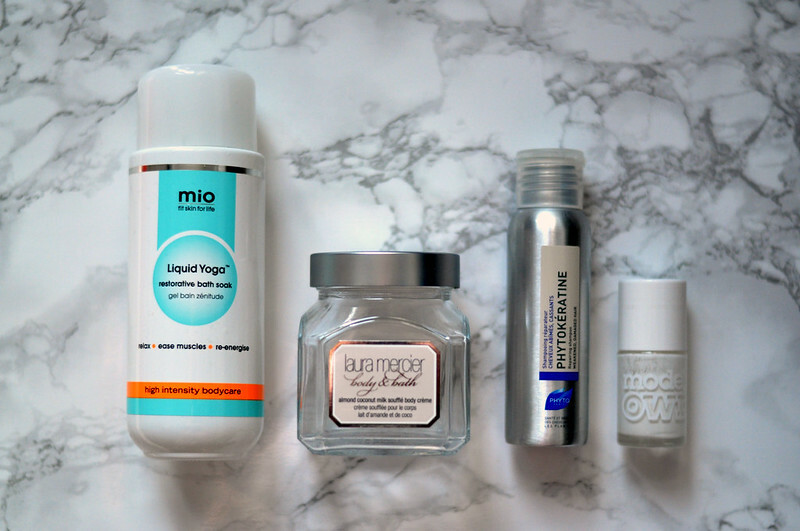 Mio is a brand I'm loving at the moment and have quite a few of their products. Laura Mercier Almond Coconut Milk Body Cream // Despite loving the honey bath from Laura Mercier and hearing other people rave about the body soufflé’s, I wasn’t really that keen on it. I found it quite heavy on my skin and it took a while to sink in properly. I’m one of those people that hates to wait around for moisturiser to sink in and I just want to put my clothes or pjs on straight away. I wouldn’t buy another one of these and will stick to other creams that I know work for my skin. Luckily I got this in a set in the sale last year and didn't pay full price for it. Lush Granny Takes A Dip Bath Bomb // I liked the scent of this one but I didn't love it. It's a mix of ginger, pepper and lemon which I think is quite unusual for Lush, especially the pepper element. This was quite a large bath bomb and one that you could easily break into two pieces to make the price better. I really liked the rainbow patterns the different layers created in the water and it made the water incredibly moisturising. Purely because I didn't love the scent I don't think I'd buy it again and instead will stick to the scents I prefer. Lush Christmas Penguin Bubble Bar // This was the bubble bar I took with me when I was house sitting last month and finished up the last of it the other week. This had a citrus scent along with bergamot and was a nice one to use when I wanted a morning soak at the weekend. Lush Pop In The Bath Bubble Bar // This is one of my favourite bubble bars from Lush as it has the same scent as Olive Branch shower gel. I had this tucked away from my birthday in June last year and I'd completely forgotten I had it. Despite having it for eight months it hadn't lost any of it's scent and still worked just as well at creating a mound of bubbles. Lush Love Locket Bath Bomb // You're meant to crack open this bath bomb to reveal a smaller heart inside filled with agar hearts. I managed to get three baths out of this one which made the expensive price that little bit better although it would be one I'd buy often if it wasn't limited edition. I really liked the vanilla, jasmine, gardenia and neroli scent and the effects the bath bomb gave. Lush Floating Flower bath bomb // This is one of the products I wish I had smelt in store before I made my online order as I wasn't a fan of the overpowering jasmine scent. I like jasmine scented products as long as it isn't the dominant scent but unfortunately this wasn't the case for this bath bomb. I still used it and the scent wasn't as strong once it had dissolved into the water but I wouldn't buy it again. Lush butter bear bath bomb // This is the same as Butterball bath bomb but it was in the shape of a bear. This is a nice one if you want to use a subtle scented product but one that is incredibly moisturising. Once this hits the water you can see the cocoa butter melting and turning into an oil in the water. Lush Bearded Lady Bubble Bar // This was from the Lush Kitchen around Christmas but I think it might have been part of the Christmas 2013 collection, I can't remember. The scent of this one was a little bit disappointing as it seemed to disappear once it was crumbled into the water. Phyto Phytokeratine Repairing Shampoo // I really enjoyed using this shampoo from Phyto and I noticed a difference in how dry my scalp was after using it. It didn't have the normal shampoo consistency, instead it was more like a conditioner so it didn't lather up that much but I also had to make sure I properly washed it out. Despite it only being a small bottle, it lasted a really long time. I'm currently using a couple of other Phyto shampoos which I am also liking but I would buy this one again. Models Own Snow White Nail Polish // Similarly to black nail polish, I only own two white nail polishes so I go through them quite quickly compared to others. I liked this one from Models Own as it was opaque with only two coats, sometimes I could get away with only one, and it wasn't streaky which I've found with others. I'm currently using Alpine Snow from OPI but I would buy this one again.